A 2-year-old girl whose mother is shot to death while holding her. A 12-year-old so behind in school she gets depressed, disengages and drops out. A homeless 18-year-old who faces daily anxiety about where he will be able to sleep. These are some of the many faces of children's mental health in the District. Every year, my colleagues serve more than 2,000 children a year, many with experiences like these. Every child, every caregiver, every case is different. But one of the constant refrains is the need for more and better mental health services in DC. Good mental health is essential to a child's overall health and development, as well as ability to learn in school, live with his or her family and thrive in the community. It is as necessary as nutrition is to a child's physical health. To succeed in its other reform efforts -- cutting truancy and dropout rates, returning special needs students from nonpublic placements, reducing the number of children in the child welfare and juvenile justice systems -- the District must create a quality children's mental health system. There is a direct line, for example, between trauma and truancy that runs through the mental health problems resulting from the trauma. An 8-year-old boy who witnesses domestic violence at home, or is a victim of abuse himself, will go to school carrying feelings of fear. He won't be able to focus on learning when he's full of worry, afraid there might be another beating tonight. Even if he and his mother escape their abuser, if he doesn't receive treatment the effect of the trauma will impact his ability to focus in school, and he'll fall further behind in school. As his grades drop, so will his interest in school. By the time he's 12 or 13, he will start skipping class and soon become truant on a regular basis. But mental health treatment earlier, when he was still that fearful 8-year-old, could save him from this negative spiral. Last year Children's Law Center published a plan with practical recommendations to improve the children's mental health system in the District. Today, Children's Mental Health Awareness Day, we are releasing a report card that assesses progress in the areas outlined in our plan. The District is making some progress. DC has received two federal grants for mental health planning, training and service delivery. The Department of Health Care Finance (DHCF) has plans to improve their oversight of the managed care organizations which deliver health services to low-income children. And a group is working to find ways to better link related issues of pediatric and mental health, including screening and psychiatric access. The DC Council and the Gray Administration must build on this momentum, because there are still many areas that need work. Our report card rates the District as "making progress" in only three of seven areas, with two areas graded "incomplete" and two "needs improvement" in the past year. Before real success can be achieved, the District must address the continued fragmentation of authority. No single agency is in charge of running the children's mental health system or reforming it, and efforts at cooperation and coordination are moving slowly. My colleagues and I want the city to succeed -- for all of the District's residents and especially for the children who need mental health services. We have published our report card to provide a pathway to success by showing where more work is needed. 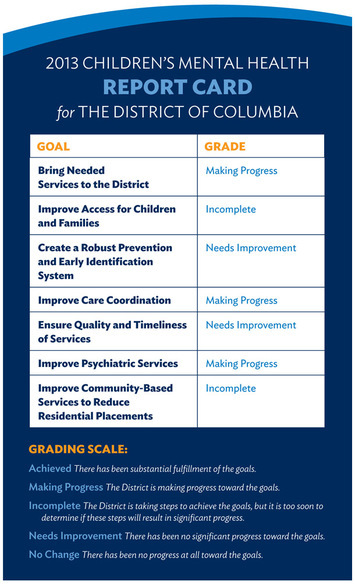 With leadership, wise budget decisions and sustained, smart work, the District can build a working mental health system to ensure our children reach developmental milestones, succeed in school, remain at home with their families and cope with the trauma in their lives effectively rather than repeating the cycle of violence. We look forward to helping DC move forward toward a fully functional, easily accessible, high-quality children's mental health system.